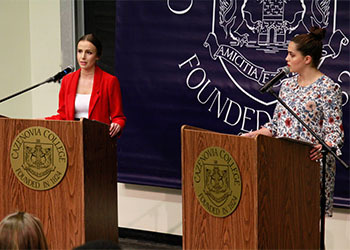 On Wednesday, May 2, the Cazenovia College Debate Society held its 18th Annual Great Debate on the question of whether all U.S. citizens aged 18 and above shall be required to vote in federal elections. Both teams presented strong advocacy, however, in the end, the Opposition Team prevailed. "I am proud of this year's student advocates, both for their performance and for the many weeks of work and growth that brought us to this moment," comments Maureen Louis, J.D., communication studies professor and debate coach. "Both teams showed excellent professional deportment and sportsmanship throughout." The Great Debate included prepared arguments, cross-examination and questions from the audience. Two teams, affirmative and opposition, will tackled the pros and cons of the issue of whether or not all U.S. citizens aged 18 and above shall be required to vote in federal elections. Open to all Cazenovia College students, and a required course for communication studies students, the debate course gives participating students the opportunity to better understand the role of public advocacy and debate, and to build communication skills. Topics covered include critical thinking, advocacy and reasoning, techniques in argumentation, and defense strategies. A special thank you goes out to the members of the Great Debate panel of judges: Dr. Sharon Dettmer, Betsy Moore, Dr. Heather Maloney-Stassen, and Dr. Bruce Roig.